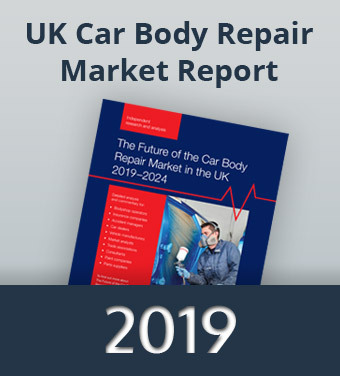 Our latest report on the car body repair industry, The Future of the UK Car Body Repair Market 2019-2024, provides extensive and in-depth coverage of the market and supply chain structure, including repair volume, cost and dynamics. As in our previous reports, our comprehensive analysis and commentary and forecast of future trends is unique and uses primary researched data. Our internationally recognised report is of interest to: • motor insurance companies, vehicle manufacturers, bodyshop networks, bodyshop groups, paint and distribution companies plus other product manufacturers within the supply chain, trade bodies and media. The 2019 Report is £1495. PLEASE NOTE: Once published in early 2019, the electronic PDF and PowerPoint version of your package will be sent to you within 24 hours. The hard copy report will be sent via post as soon as practically possible and should be received within seven days.